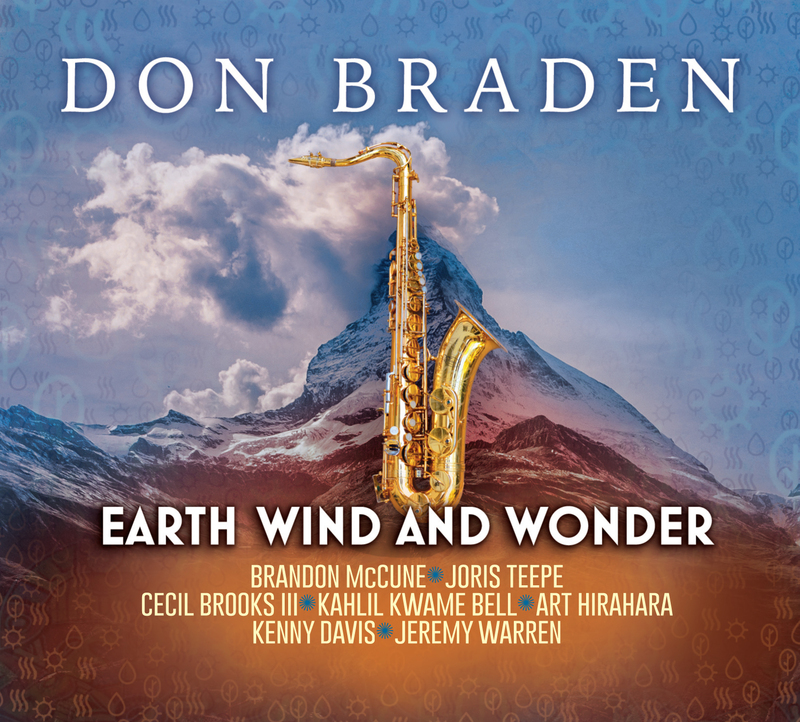 Creative Perspective Music is proud to announce the May 4th, 2018 release of saxophonist Don Braden’s highly anticipated new project, Earth Wind and Wonder. On this exciting new project, the world-renowned saxophonist explores the wide-ranging catalogue of Earth Wind and Fire and Stevie Wonder. Braden is joined by two stellar rhythm sections that include pianists Brandon McCune and Art Hirahara, bassists Joris Teepe and Kenny Davis, drummers Cecil Brooks III and Jeremy Warren and percussionist Kahlil Kwame Bell. As a young man growing up in Louisville, Kentucky in the 1970s, Braden discovered the music of both Earth Wind and Fire and Stevie Wonder, and it immediately captured his heart, mind and soul. The esteemed saxophonist explains that “the messages within their music – built around core themes such as strength, love and joy, are imbued with African-American spirit, and yet embody a wide variety of human emotions and experience. They are delivered with power, artistry and elegance via memorable and singable melodies, rich harmonies, compelling lyrics, infectious grooves, outstanding arrangements and superb performances.” While Braden’s career grew in the direction of straight ahead jazz, he continued to listen to and study the music of his early musical heroes. Earth Wind and Wonder augments the repertoire of “contemporary standards” that Braden has accumulated over the years; jazz interpretations of his generation’s “American Songbook”. As a matter of artistic and emotional expression, Braden enthuses that his exploration of this music has been highly rewarding, stimulating and fun! The ten tracks that appear on Earth Wind and Wonder showcase the astounding versatility and adaptability of EW&F and Stevie Wonder’s legendary catalogue. Standout tracks include album opener “Fantasy” from EW&F’s All ‘n All, a grooving shuffle version of Wonder’s “Higher Ground”, a reharmonized, sultry rendition of Wonder’s “Visions”, and a stunning interpretation of EW&F’s “After The Love Is Gone”. Also noteworthy are two of Braden’s original compositions (“The Elements” and “The Wonder of You”) that take inspiration from the album’s concept. This project was completed and perfected over the course of three separate recording sessions, the first being in Summer 2014 with Brandon McCune, Joris Teepe and Cecil Brooks III. Later that year, Braden unfortunately got sidelined by a scary, potentially career-ending surgery, which, thankfully, went well. In 2016, Braden was commissioned to perform this music with the Litchfield Jazz Orchestra at the Litchfield Jazz Festival. Inspired by writing big band charts of this material, Braden got back into the studio in September 2017 to record more songs with his most recent working band: Art Hirahara, Kenny Davis, and Jeremy Warren. Finally, in early 2018 Kahlil Bell recorded percussion on several tracks. Each of these incredible musicians brought their own flair, and through their incredible support of Braden, have been amazing partners in the development of this music. Earth Wind and Wonder follows last year’s outstanding release Conversations, which featured Braden alongside Joris Teepe and drummers Gene Jackson and Matt Wilson. This critically acclaimed album went on to receive numerous accolades including a four-star review from Downbeat. Braden presents this grooving new album in the hope that his audience will become energized and inspired by the music, in a way that encourages them to listen with new ears. Don Braden is a world class musician who has recorded and toured with a number of jazz luminaries, and has produced 21 albums as a leader. He attended Harvard University as an Engineering major but decided to pursue his love of jazz, eventually being dubbed as one of the so-called “young lions” during the 1980s. Braden has written hundreds of compositions for a variety of ensembles, from duo to full symphonic orchestra, including many for TV and film. In addition he is a highly experienced jazz educator, having taught at several institutions (including Harvard University and the Litchfield Jazz Camp), and having presented numerous workshops around the world.